I must admit, I'm not that familiar with the stories of Sherlock Holmes (although I have been to the site of his literary death - Reichenbach Falls outside of Meiringen, Switzerland). I've never read any of the four books or 56 short stories by Sir Arthur Conan Doyle that form the basis of the popular detective story, or seen any of the countless movies (unless you count the recent Robert Downey Jr. version). My only real familiarity with the story is the fantastic new show Elementary, CBS's modern-day NYC-set take on the story. So I don't have a lot of attachment to or knowledge of the mythology of Sherlock Holmes. 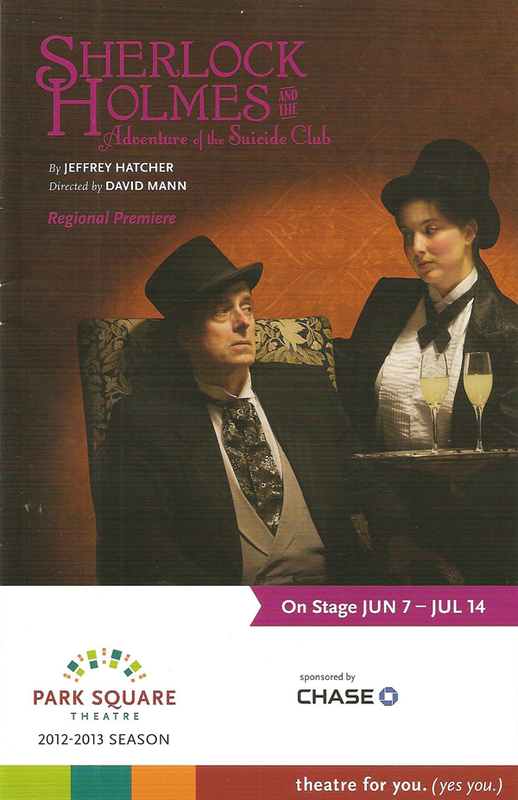 Fortunately that is not required to enjoy Park Square Theatre's current version, in which prolific and talented local playwright Jeffrey Hatcher takes the familiar characters from Doyle's stories and applies them to Robert Louis Stevenson's trilogy of short stories The Suicide Club. The result is a new creation that is amusing, clever, and deliciously suspenseful. As in most of the original stories, this tale is narrated by Holme's trusty sidekick Watson (ably portrayed by Bob Davis). As the story begins, Holmes is despondent (by his own admission) and exasperated, a little worn down by the trials of life and his work. But he's still at the top of his game - curious, observant, and clever. Steve Hendrickson easily slips into the skin of the titular character (the third time he's played the role at Park Square), creating a character just as memorable as he the one he played in another mystery play, Deathtrap at the Jungle earlier this year. Holmes finds himself investigating a group called The Suicide Club, in which people who want to take their own lives but are unable to do so agree to kill each other in a random fashion. They draw billiard balls from a hat - the one who draws the black ball is the lucky one to die, and the one who draws the red ball does the deed. (One wonders how such a club that meets every night keeps their membership up.) Club member Prince Nikita (a charismatic as ever Bryan Porter) alerts Holmes to some suspicious happenings in the club, which seem to lead back to the mysterious Club Secretary (Charity Jones, sleek as a cat). But who is she really working for? Watching Holmes decipher clue after clue to lead him to the answer is half the fun of the play. There's not a weak link in this multi-accented cast. 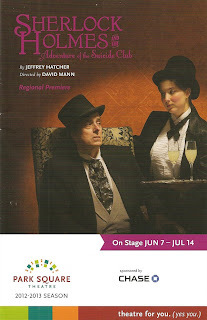 In addition to those mentioned above, highlights include Nathan Christopher as the cream puff-eating club member who invites Holmes into the club, Bruce Bohne as the wheelchair-bound and uber supportive club member, and Karen Wiese-Thompson as Holmes' landlady and several other characters. All the men are dressed in top hats and tails (costumes by Andrea M. Gross); why not dress up for death? Michael Hoover (set design) and Todd F. Edwards (projection design) have together created a very clever and effective backdrop for this familiar story. At first glance the Park Square stage looks empty - with few set pieces and trapezoidal screens of varying sizes in the background. But as the scenes change, still images fill the screens to create a specific world - Holmes' book-cluttered apartment, the billiard hall, the dark and lonely London streets. It's an elegant way to affect the change of scenes without moving a lot of bulky set pieces around, which makes for smooth scene transitions (accompanied by appropriately creepy music). I'm catching this one near the end of its run - only five performances remain. If you're able, check it out this week for a fun and thrilling take on the classic detective genre.